For example, tonight I was at home by 6pm. Mario had dinner on the table by 6.15pm, and by 7pm I was cleaning up. Then began the chores and the list of things to do. Tonight I have completely pulled apart Rosie, our amazing robot vacuum cleaner, and given her a thorough do-over in cleaning her bits (sounds a bit rude doesn’t it). I’m now about to update my budget and bills and see how I’m tracking for the month. By the time I’ve finished that it will be about 8pm. I get half an hour to do something, then I’m in bed by 8.30am. It’s really not that much is it? In the morning is when I get the most time to myself. I utilise the time by working out either at the gym or a run down the beach, and a recent development, cook something to take to work for a snack. There’s usually some form of housework to be done, but only minor bits as Mario and I mostly share the load. Usually I’m either hanging out clothes or bringing it in, and if I can stand the heat upstairs, folding them. Rosie gets switched on and does her thing vacuuming the floor downstairs while I then get ready for work. I really can’t imagine fitting kids into that equation, which means I’m clearly not ready yet. I’m going to enjoy this time while I can! This Thursday I’ve also got book club with the ladies, for which I’m behind in reading the book. Let the cramming session begin. It’s very tempting to go lay upstairs on my hammock on the balcony (again – thank god for no kids) since the breeze is beautiful and welcome after the recent heat wave. 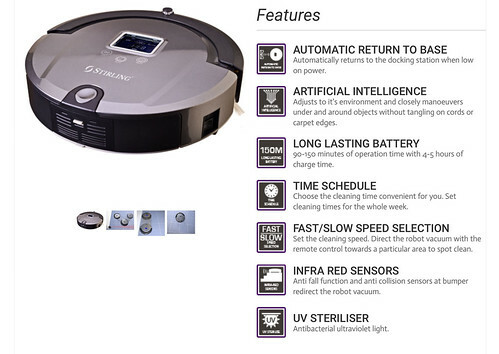 I’ve mentioned her but never really done a review, so let me introduce Rosie, my super amazing Stirling robot vacuum cleaner. Of course I need to review this baby. I had been hanging out for one of these for ages but Mario kept insisting we didn’t need it. My dog sleeps inside at Mario’s place, which means every morning I’m confronted with a pile of black fur all blown up against the step into the kitchen. My OCD about the floor kicks in (I can’t stand the site of the hair) so then I end up sweeping the entire house or lugging the vacuum cleaner from upstairs. That thing has to be so clogged with dog hair by now, and it’s the old bag style thing so a bit costly to empty all the time. Finally I saw one on special at Aldi for $179. A week of umming and ahhing, finally I decided to go to Aldi and see if they still had one despite being nearly two weeks after the sale. It was fate, and I walked out a very happy woman. Mario rolled his eyes when I got home, and grumbled about how they don’t work and we don’t need it, blah blah blah. Rosie, named after the robot maid from the Jetsons, is still used daily. This is clearly a great purchase, because every morning I have saved myself about 20mins in sweeping/vacuuming time. Instead I sit at the dining room table happily eating my breakfast while she zooms around me. My dog isn’t a fan and will move to the other side of the room from her, but that may be due to the fact that I used the included remote control to direct Rosie to chase after her. I’m mean. It does a pretty damn good job, although it won’t ever replace our main vacuum cleaner for deep cleaning. Yet Rosie works an absolute treat on the wooden floors and tiles downstairs, and while she can’t cope with the thick rug downstairs the carpet upstairs hasn’t been much of a challenge. It’s super easy to clean, simply take out the back and shake the dirt into the bin. Open the dust filter, shake that out a bit and on the odd occasion rinse her off (the manual recommends using a hair dryer to clear it though). Total time spent on the vacuum cleaner to get clean floors daily: 1min. It came with a remote control and a virtual wall barrier, so in the mornings I put the barrier up in front of the rug. Then away she goes throughout all the dining area, and after about 15 – 20mins I move her up to the kitchen. 1min emptying the vacuum cleaner vs 20mins sweeping everything and still leaving hair behind? Yeah I know which one I prefer. Down sides? If I really had to push it I would say that it will sometimes, rarely, struggle to get a bit of dust in a corner but that’s if I’m behind the controls rushing it through. Otherwise left to its own devices it gets there. Put it this way, I even caught Mario admitting to his mother that it’s great. That is an achievement in itself my friends. Dammit, it’s 7.45pm and I still have a load of housework to do. Whoops. Maybe you should have kids and then do another review of the vacuum?